The true joy of coaching is the opportunity we get every day to build relationships with others and help individuals, groups or teams push forward towards a goal. Lifting others is the ultimate reward and fulfillment. A [strength] coaching career is full of lifting others, both literally and figuratively. Right now, the vast majority of strength coaches, team coaches and personal trainers are dealing with two main generations of athletes/clients. Generation Y, also known as Millennials, and Generation Z, also known as the iGen. What do these generation names mean anyway? And what does it even matter? Knowing your athletes on a deeper level can pay dividends in building trust and relationships. One of the best ways to connect with someone is truly making an effort to understand them as a whole person, not just an athlete. This means knowing their upbringing, their family background, their interests, their non-physical attributes and, yes, their generational tendencies can all play a role in making your coaching more effective. Generation Y, Millennials, are individuals born between 1980-1994. Millennials are currently between 24 and 38 years old. Generation Z, The iGen, was born between 1995-2012. They are all currently between 6 and 23 years of age. In our world, Gen Y are our everyday fitness enthusiasts or professional athletes. Millennials are adults now, contrary to what pop-culture would lead you to believe. Gen Z are our middle & high school athletes plus the collegiate population as well. This is where much of the confusion has come from. Many people don’t know these cutoff dates for each generation, so young people in general are often clustered together. In all actuality, these generations have some definite differences though. Below are some of the key characteristics of Gen Y and Z, and how you can adjust your coaching to benefit each. It’s important to note that these are generalized traits that Business Insider, LinkedIn, CareerPlanner and other research firms have published. These do not define every single individual of each generation. There are outliers, both good and bad. I think it’s just crucial to focus on these very broad pieces of info and then customize it to fit whatever situation you’re in. The biggest knock you’ll hear about millennials is that they’re selfish and entitled. Not entirely true. Millennials are just very focused on personal growth. This doesn’t make a person selfish, self-centered or narcissistic automatically. Millennials are at a stage in life that growth is vital. Whether it’s career, family, wealth or relationship growth, the pressure is on millennials to grow. A tip for feeding this growth mindset is by using feedback methods that operating in real-time and relating it to that individual’s ultimate goal. For example, using a tool like TeamBuildr can enable a coach to show instant progress from a 405 1RM Trap Bar Deadlift to a 550 1RM with the click of a button. That shows the millennial the growth they crave and can be elaborated on by the coach in terms of how that can have positive effects on athleticism. Millennials are incredible at multitasking. Again, the pessimists will say they can’t focus and don’t work hard enough to see projects through, but really the gift is the ability to handle and conquer multiple tasks at once. This generation grew up in the developing stages of tech advancements and under how utilize, but not rely on, technology to help juggle all kinds of responsibilities. For coaches, this multitasking mentality can pay off by offering athletes additional leadership opportunities. This could be leading warm-ups in a class or training session, assigning a team captain or giving them a larger role in the workplace. They will adapt and handle them. Giving an athlete these opportunities allows them to work on their leadership skills, help mold other leaders within the program, build confidence and ultimately become a better teammate or employee after sports. It’s a win-win-win for coaches, athlete and the workplace. Generation Y is always connected. Whether it’s in person or through technology, millennials are connected to pop culture, news, other millennials and are actually more consciously aware than most get credit for. While technology is definitely a major source, they don’t completely rely on it, but rather see it as a tool. This is simple… get connected with them! This makes communication seamless between the coach and athlete. More opportunities to create a bond, develop trust, lend wisdom and grow closer to the athlete are important for both the success of the athlete and coach. Social media posts or simple motivation texts throughout the week or words of affirmation like, “Great work today, keep it up,” take 10 seconds to send and the ROI is 10-fold. Be genuine, though. Communication can also include constructive criticism or helpful tips on how to optimize training, nutrition or recovery. Millennials flat-out love instant gratification. I think this is partially because for at least some part of our (I am a millennial) lives, we did not have instant access to so many things we have today. For example, Amazon, Google and Netflix solved actual problems (first world problems) for us. Amazon allowed us to instantly purchase items. Google allowed us to instantly find information. Netflix allowed us to instantly watch movies or TV. Those are all things, at some point in our life, were not instant. And the instant version is awesome. Unfortunately, some of that spilled over too far and instant gratification became an expectation rather than a privilege. Enter weight loss pills or wraps, multi-level marketing schemes and other too-good-to-be-true instant success plans. The key to keeping that instant gratification hunger fed in your millennials is to find ways to get better every single day and instilling that into the athlete. Progress is a marathon, not a sprint. A slow cooker not a deep fryer. We have to educate our clients to understand the why behind programming and exercise execution, then support that by showing actual proof that it’s working. I mentioned earlier that millennials are more socially aware than most people give them credit for. I’ll admit, politics aren’t our strong suit, but we are very hyper-aware of socially critical situations. Being socially conscious means millennials truly want find a way to make an impact on the society, economy and culture. The catch? This generation has a vision and wants to do it on their own terms. Some find it intimidating. Others find it inspiring. One thing I’ve implemented is trying to learn at least one thing from every athlete every day. It doesn’t have to be about anything in particular, I just want to have enough dialogue during a session to walk away saying that I learned something from our about that individual. Whether it’s lighthearted or a deeper, more serious subject, trying to see the world through their lens will be a game changer. The iGen may be the most open-minded, adventurous generation of all-time. This generation is very comfortable in nearly any setting and don’t typically view things through a divisive lens. As a coach, you need to match their open-minded approach to life. It’ll amaze you how much you’ll learn about yourself and others just by broadening your outlook on life. One major way to implement this is by giving your athletes equity in their programming. 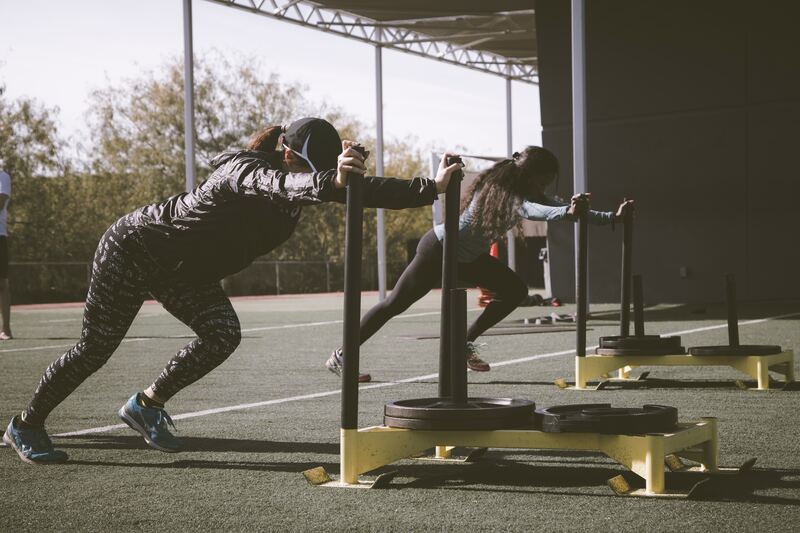 You can accomplish the proper amount of volume in the big movements - squat, hinge, row, press, lunge, carry, jump and spring - and still have enough room left in programming to give the athletes some say in the overall program. Put the ball in their court. You can nix all stupid ideas and keep the ones that make sense. Believe it or not, some of my favorite exercise variations have come from curious athletes asking questions or giving suggestions and our staff using it create an effective exercise. This is where Generation Z differs from Y. Generation Y, Millennials, are tech savvy. Generation Z is more tech-dependant. Their entire life has involved new waves of technology that Millennials didn’t see until much later in their life. I got my first phone when I was 15, for Christmas. It was a pre-paid phone that allowed me to call my mom and say, “Hey, I’m done” when basketball practice was over. That’s it. Maybe I played some “Snake” on it. Obviously, as a Millennial, I know that even that is way more advanced that my parents’ generation. I say all that to set up the example of technologically dependant iGen kids… I know several sixth graders who have iPhones. And Twitter. And Instagram. And SnapChat. It’s not a resource from them, it’s THE resource. Make no mistake, this is not inherently a bad thing. Technology is necessary now. It makes hard things easy and makes easy things effortless. It makes us more efficient… well, it can. Coaches can carefully introduce technology into the weight room and get a great reception from the iGen athletes. The general perception is that technology will create a distraction in the weight room, but in the last year or so I’ve been using fitness tech I’ve actually found that to be exactly opposite of what happens. The technology we use at my facility, PACE Fitness Academy, helps athletes in so many ways to stay focused while training. In VBT training, the athletes are laser focused on hitting their velocity goals and learning more about how and when to autoregulate during these sessions. With TeamBuildr, our athletes are almost obsessed with keeping their programs up to date by filling in their sets, reps and athlete notes for coaches to review. This topic could be an entire article, but the very important takeaway I want coaches to see is that there is great value in strategically implementing some tech for iGen athletes. It’s been a part of their life since day 1. They aren’t distracted by it, they actually perform better in many cases (in or outside the gym) with technology in the picture. Another glass half-full viewpoint of a Generation Z trait is their massive use of non-formal communication. Some say this generation just doesn’t know how to communicate face-to-face due to their heavy reliance on technology, but there are positive ways to spin this. Non-formal communication goes beyond social media and text messaging. Body language is also a form of non-formal communication and it can really assist coaches in reading a room. Generation Z, like Millennials, also get stereotyped as entitled but I don’t really see it that way in most cases. What’s true is that iGen athletes love public recognition. Let’s be real, we all do. Everyone loves a pat on the back from time to time. Public recognition makes us feel great about the hard work we’ve put in paying off. Key words: Hard work. As coaches we can give unlimited public recognition with one caveat; It has to be earned and the athletes have to understand that. This eliminates all risk of entitlement. Standards must be set and adhered to so that your athletes know everyone comes in on the same level and the only thing that take you up a notch is your work on that very day. Yesterday doesn’t matter. What you did last season doesn’t matter. What people think you’re capable of this season doesn’t matter. The work an athlete puts in on that very day is the only separator. And the cycles refreshes every day. It’s very gratifying to hand out those praises, especially when you and the athlete both know it was hard earned. Generation Z isn’t called the iGen for nothing. Just like Apple, the innovators of iProducts, these athletes have a very entrepreneurial spirit. This is another reason why their heavy use of technology isn’t all bad. They have access to resources and information and know they can control their own career destiny. Gen Z wants to create, innovate, invent and showcase their talent or their creations. With this entrepreneurial mind, comes the attitude of one day being their own boss. Sometimes they get carried away and think they are already their own boss, which can get tricky for authority figures. The most important way to keep this from going down a wrong path is to set a expectations upon first interaction, meaning let the athletes know how you like to see a session flow, things you don’t like to see and how you deal with issues within the program. I hate the term, “Show them who’s in charge,” or “Show them who’s boss,” because all that promotes is fear and the perception of entitled authority. Instead of trying to show them who’s boss, just show them how efficiently you run your program, why you want them to be a part of it, hot it can help them reach their goals and explain why you do what you do. After all, if our athletes have to earn respect so do we as coaches. And we can do that by pouring everything we have into developing the athletes. Hopefully these 10 tips help you refine some of your processes and better connect with whatever age or experience level you work with. Learning these things about Millennials and iGen athletes has helped tremendously in creating a much more tight-knit community of coaches and athletes in our facility and the surrounding area. We have a family-like atmosphere and the results are becoming a great byproduct of an awesome training environment.